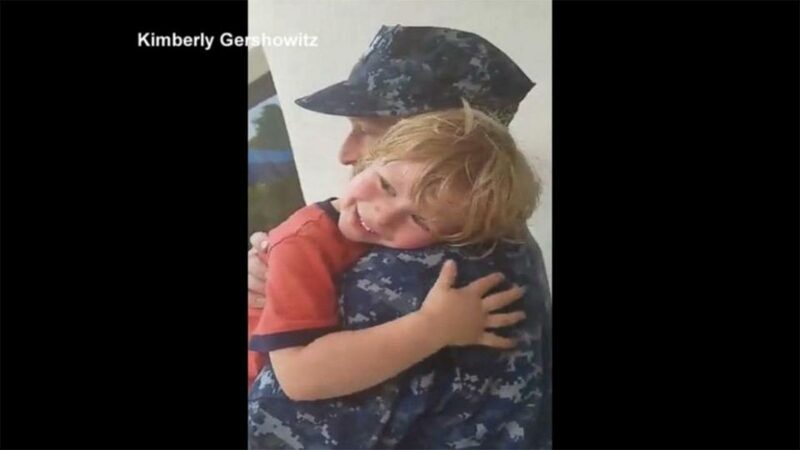 GEORGIA -- A beautiful reunion between father and son is touching hearts across the globe. Aaron Gershowitz is a MM1 nuclear mechanic on a submarine with the Kings Bay Naval Base in Georgia. He had been deployed for three months before coming home to his family in May. Upon his return, Aaron wanted to surprise his 4-year-old son Matthew at his daycare center. Aaron's wife, Kimberly Gershowitz, recorded the occasion on video, which she said brought her to tears. "I did not expect the emotions and the things that came out of the mouth saying, 'I cried so much for you,'" Kimberly recalled. "I didn't realize how much it affected him until I heard him talk and then I lost it. That kind of hit me hard." Kimberly shared the video with the "Love What Matters" Facebook page Wednesday, where it was viewed over 600,000 times. "The outpouring of love from people all over, their comments about my child and his upbringing, it was so touching and emotional," said Kimberly, who has another son, Keith, 2, with Aaron. "It made you realize that people do care that your husband is serving and protecting them. I was overwhelmed." Since returning home, Aaron has been enjoying as much family time as possible.